A telescope that scans the cosmos to measure the expansion of the universe recently had its massive digital camera tuned up to ensure its eyes are finely focused on the heavens. 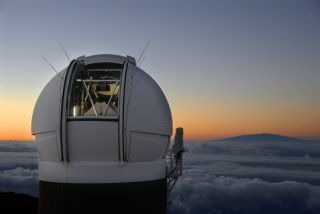 A group of scientists from the National Institute of Standards and Technology traveled to the summit of Haleakala volcano in Hawaii to modify a 1.4 gigapixel camera – billed as the largest digital camera in the world – on the Pan-STARRS telescope. The powerful Panoramic Survey Telescope & Rapid Response System (Pan-STARRS) began science operations in May 2010 and is primarily geared toward seeking out potentially hazardous asteroids that could threaten the Earth. For the telescope's tune-up, scientists tweaked the operation of billions of light-collecting pixels in the instrument for use scanning the cosmos for star explosions known as Type IA supernovas. These dying stars in distant galaxies always shine with the same luminosity as other Type IA supernovas, making them useful to astronomers who use them as "standard candles" for judging distance in the universe. Any apparent shift in the supernova's spectrum gives a measure of how the universe has expanded (or contracted) as the light traveled from the supernova to Earth. As such, these supernovas could hold the key to understanding whether the expansion of the universe is mysteriously accelerating. Because Type IA's are valuable as cosmic signposts, astrophysicists want to be sure that when they observe one of these faraway stellar cataclysms, they are getting a clear and accurate picture – particularly important given the current puzzle over why the rate of expansion appears to be increasing. "Pan-STARRS will scan the same areas of the sky repeatedly over many months," John Woodward a scientist at NIST said in a statement. "It was designed to look for near-Earth objects like asteroids, and it also pulls double duty as a supernova hunter. But for both jobs, observers need to be sure they can usefully compare what they see from one image to the next." Ordinary calibrations involve a telescope's performance at many light wavelengths simultaneously, but Pan-STARRS needed to be calibrated at many individual wavelengths between 400 and 1,000 nanometers. “We specialize in measurement, and they needed to calibrate the telescope in a way that has never been done before," Woodward said. For the job, Woodward and his colleagues used a special laser whose wavelength can be tuned to any value in that range. The telescope's powerful camera was then tested over a period of three days. Since these calibrations are the first of its kind, it is unclear just how much effect the team's work will have, Woodward said. Part of their future work will be determining how much they have reduced the uncertainties in the performance of the Pan-STARRS telescope. Scientists will use that information to then make modifications to a much larger telescope – the Large Synoptic Survey Telescope, which is planned for construction in Chile.